Heat a medium skillet over medium-low heat. Add the pumpkin seeds and let them toast, slightly, until they start making popping sounds and have begun to darken, 3 to 4 minutes. Scrape onto a bowl and let cool. In a medium saucepan set over medium-low heat, combine the water, brown sugar, granulated sugar, piloncillo and corn syrup. Stir with a wooden spoon or spatula until the sugars dissolve. After 15 minutes or so, the mixture will have achieved a very thick syrup consistency and will be actively bubbling. Check with a candy thermometer to make sure it reaches 290 degrees Fahrenheit (but no more than 300 degrees), or the sugar is at “punto de bola” or “hard crack” stage, then, turn off the heat. Oh my gosh, I had a mess and wasted a lot of food. I am very familiar with making peanut brittle as we used to make tons of it at church for fundraisers. So i felt comfortable using pepitas and following your recipe. I watch you all the time, make many off your recipes. I also followed the recipe exactly. First off, with the temperature on med. Low after 15 minutes I was no where near 290 degrees. It was very bubbly and changed to a dark brown color and was somewhat sticky but still thin. So after 20 minutes I raised temp to medium and could not get past 255 degrees…? So after 25 minutes I increased to medium high… recheck and finally 294 degrees 30 minutes later. Very frothy bubbly and thick. Followed directions exactly…but in 3 seconds it was all dust? What did I do wrong? Should I start off on med low until sugar melts and then increase to medium hi inn order to get the temp to 290 in 15 minutes? Also i know at church as soon as we turned off the heat first was baking soda, stir quickly, then nuts and butter..stir and spread. Am I wrong? Should I have mixed the toasted pepitas, butter and baking soda in a bowl first so that it was already ready to throw in the caramel when 290-300? Or add seperately? Thank you Mrs. Jinich! Oh I’m sorry! Making brittle an be very tricky. I’ll post a video soon to help out. Hola pati, puedo hacer un bache mas grande, o poquito a poquito? Quiero hacer bastante para un “fall theme” party. Para que todos mis invitados lo prueven. Sí, puedes hacer un bache mas grande o poquito, Flor. I remember you talking about how, as a child, you used to eat Pepitas in the movies. So, having decided to take your advice, I bought a bag and snuck them into my local movie theater. OMG! Che rico! I’ll never eat popcorn in the movies again. Gracias Pati! As i poured this into the pan it turned dry a powdery. It didn’t work. Please help me troubleshoot. I followed this recipe exactly as written, took the sugar mixture off heat at 290 and did the rest. I did not substitute any ingredients. ​It sounds like you may have cooked it too much or at too high of heat. Stovetops range from one to the other… give it another try, ​the process for caramel making can be pretty whimsical and capricious! Is the piloncillo that you use in a cone shape?? Thank you! I’m thinking of making this for my family to take home after thanksgiving. Yes it typically comes in a cone shape…https://patijinich.com/piloncillo/ I hope your family likes the brittle Liz! Is there an alternative for corn syrup? It’s difficult to purchase corn syrup in Australia. Would honey work? Alison, if you can you find maple syrup or agave syrup or can substitute with that. I followed the recipe very carefully, but I think the 6″ X 10″ baking sheet may be a misprint. The finished quantity would easily have over run that small pan. I went to a 10″ X 15″ sheet but the brittle was still so thick that I had to pound it with a mallet to break it up. When you made it on your show it was thin, amber, and broke into pieces by hand. I’ll try again with a still larger pan, unless you have a better suggestion. Ayudame, por favor! I’ve been to Cozumel MANY times and along the west coast, but I’m really enjoying visiting the east coast cities via your show. I’ve also reproduced some of your recipes. I’ve recently ordered some achiote paste that adds another level of flavor to my dishes. Me gusta mucho su presentacion. Mil gracias! ​Hmmm Jim, that is very strange. Are you sure you are doing the quantities in the recipe? with pumpkin seeds, cashews and almonds. 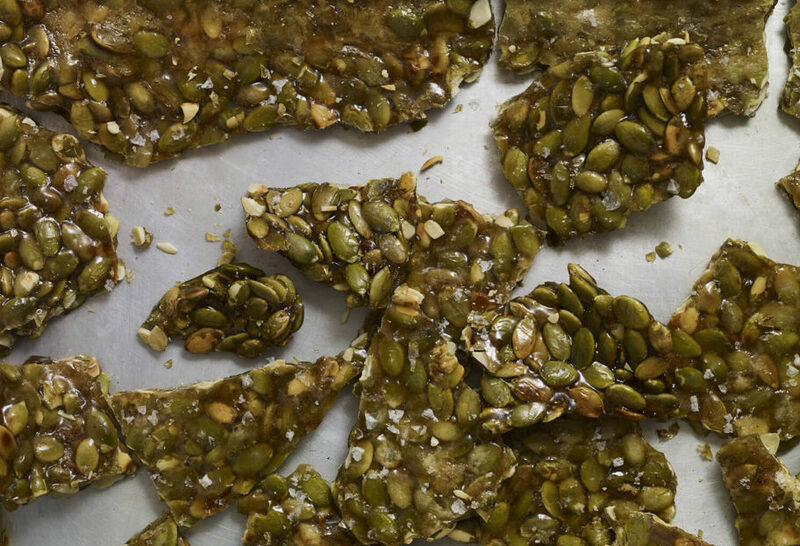 It looks just like the Pepita Brittle. I was wondering if we could add the almonds and cashews for a added change. Thanks so funny! Yes, of course you can add almonds and cashews to the mix. Haha…I REALLY do enjoy it Maria! I tried to cook this, but without a candy thermometer…so I tried to guesstimate but I don’t think I am going to be successful in getting it to firm up. Can I bake it to firm it? I made this several times. I found you have to raise the temp after the sugar melts to get the temp to increase to 290 degrees in 15 minutes. Excellent recipe. I have given the brittle to friends. They love it and ask me for the recipe. I have already given the brittle (as a holiday gift) with two of my friends, both of whom reported they ate all I gave them in one sitting (with husbands). My husband and I ate the rest of the batch together too. Making more tonight for more holiday gifts.